Travel guitars are awesome. They’re small. They can be carry-on luggage. You can take them anywhere, so you can write and practice wherever you go. The problem is that a lot of them are just terrible in terms of quality. They play poorly, their sound is thin and tinny, and they can even be awkward to hold. The only thing that’s universally good about travel guitars is that they’re cheaper than standard guitars. And they should be! Travel guitars are small by nature, so they use less materials to make. Plus, in many cases, they aren’t using the more expensive materials used on full sized instruments. We don’t want you wasting your time and money on a travel guitar that you’ll hate, so we’ve reviewed nine of them for you below. They’re not necessarily in order of best to worst, because they all have some pros and cons depending on your needs. But I’ll start with my favorite and take it from there. 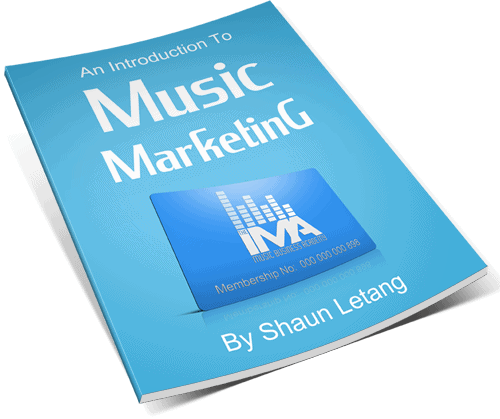 Note: If you also need top guitar lessons then check this out. 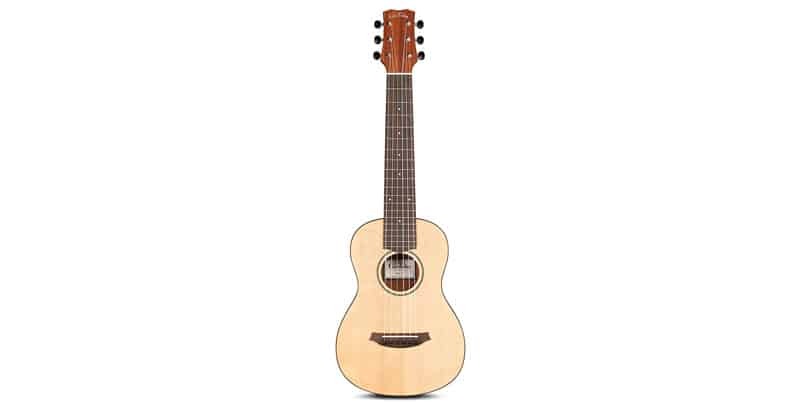 Is It Worth Finding A Travel Guitar With A Great Sound/Tone? Should I Buy A Steel Stringed Instrument Or A Nylon Stringed Travel Instrument? 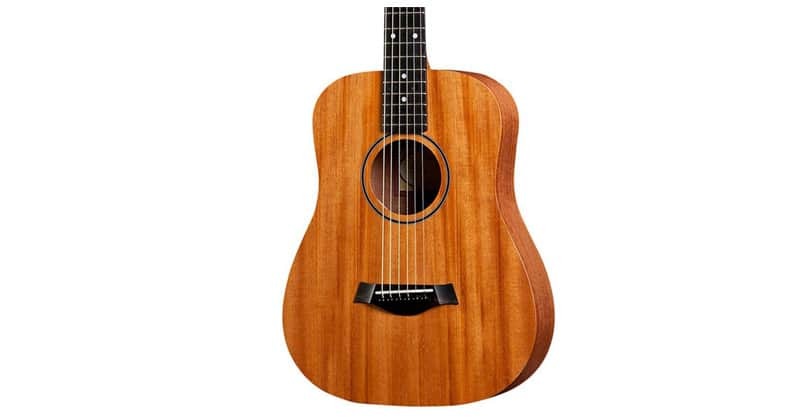 Should I Buy An Acoustic-Electric Or Just An Acoustic? The Larrivee P-03 isn’t marketed as a travel guitar, because honestly it sounds too good to be one. 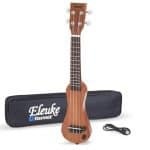 It’s a parlor guitar that’s easily small enough to be a travel guitar – especially when carried in a soft case. And, there are other parlor guitars out there in case you’re wondering. Larrivee makes some of my favorite acoustics. They’ve got this distinctive, full, rich sound. Something I’ve always loved about these guitars is how balanced their sound is. Right across the sonic spectrum, these guitars stay even and beautiful. As they’re top quality, they retail on the higher price for travel guitars. They’re also fairly difficult to find used – simply because people love them and rarely give them up. If you want a travel guitar that does more than just travel – that stands up to any full size guitar – this is the one for you. This is a great little guitar. It’s a classic dreadnought build, and all wood. It’s durable and will last you a long time. The guitar is also surprisingly loud, which is perfect for practice. It has a clean bright sound, and the fretboard is quite fast and responsive too. Now, if you’ve played a Taylor before, you’ll know that they’ve got a certain “Taylor sound” to them. Some people love it. Some people don’t. But either way, this guitar doesn’t have that signature sound. It makes for a decent travel guitar, but this is not a cheap way to get your paws on a Taylor, so don’t look at it has a hack. If you want that genuine Taylor sound, you should be prepared to fork out more cash. All in all, this guitar has an attractive look (sharper than most travel guitars) and a sound that sets it apart. If you’ve got the money, I would recommend it. Shaped like a paddle, this guitar will definitely make you stand out from the crowd. It’s a weird-looking beast, but it packs a lot of volume! What’s more, it comes at a reasonable price for a brand name guitar. As far as the sound goes, however, you are making a serious sacrifice for the portability of the instrument. The top end is loud and bright, which is fine, but there’s none of the deep richness you would expect of a Martin. Perhaps I’m being too critical – the best part about this guitar is that it’s tiny. It comes with a cool little soft case, and you can fit it pretty much wherever you need to. It’s also super-light, so you can carry it wherever! The guitar is made of solid wood, which is uncommon among cheaper travel guitars. That should give it a better sound in theory, but that’s not necessarily the case here (the shape might have something to do with that). 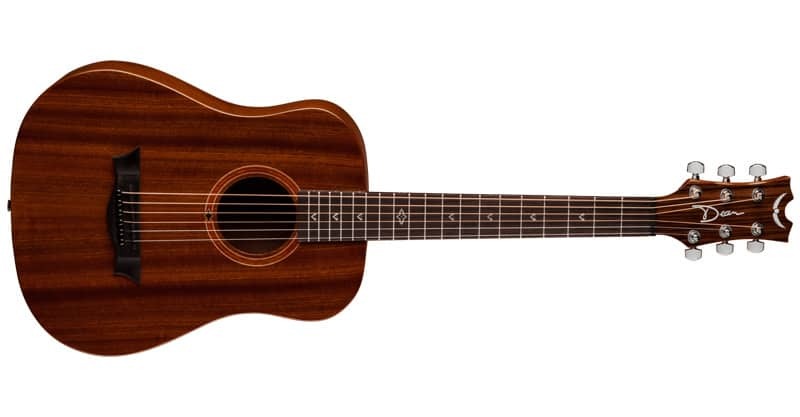 All in all, this would be my first pick for a travel guitar under $300. The durability and construction are huge bonuses for me, and while the sound leaves something to be desired, it does have a pleasant, loud tone, which is good enough for practicing purposes. This is another Martin that definitely deserves a spot on the list. 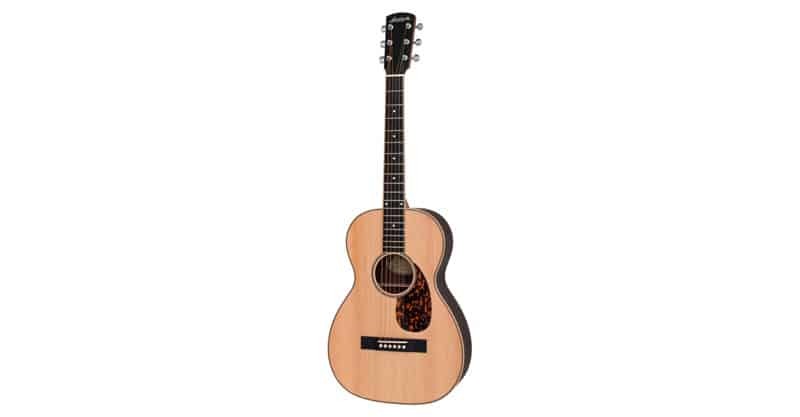 Somehow, this guitar, as opposed to the Martin Backpacker, has the rich low end you’d expect out of a Martin. There are a number of different models for this particular product, so the price range varies. This is why I feel it’s justified to put another Martin on the list. 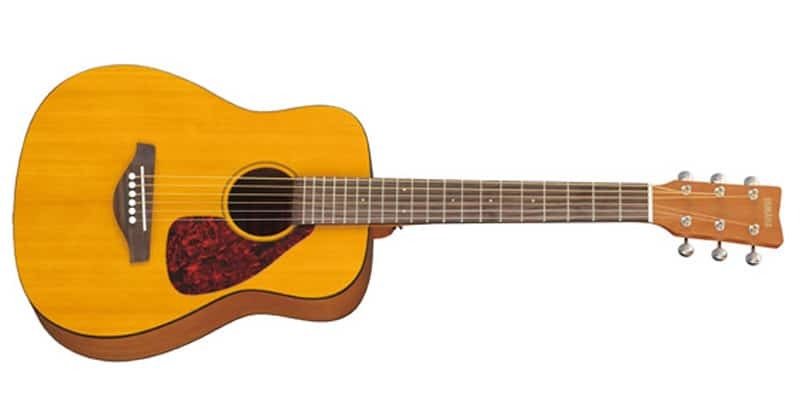 It sounds better than the Martin Backpacker, but you will pay for that difference, and this guitar is bigger. To make it cheaper, these guitars are made of laminate wood through and through. But you can get a solid-wood top for more money (of course). Personally, I doubt you would need to, because these sound great as-is. I would say that this guitar is on par with the Baby Taylor, but it just comes down to the tone that you’re into. The Taylor is shiny and bright, the Martin is rich and, well, Martin-y in tone. This little guitar is one of the best in the cheaper range. It’s billed as a great kid’s guitar, as well as a travel guitar. Because of its aim at the kids market, it’s built very well. Well enough to hold up to how kids typically handle their guitars! The sound is fairly loud and clear, which is all you can ask of a guitar of this price range and size. The FGR1 looks like many of the full-size Yamaha’s do, except smaller. The neck is quite playable and it seems to stay in tune well too. The only reason I would buy the Martin Backpacker over this gem is because of its truly tiny size. 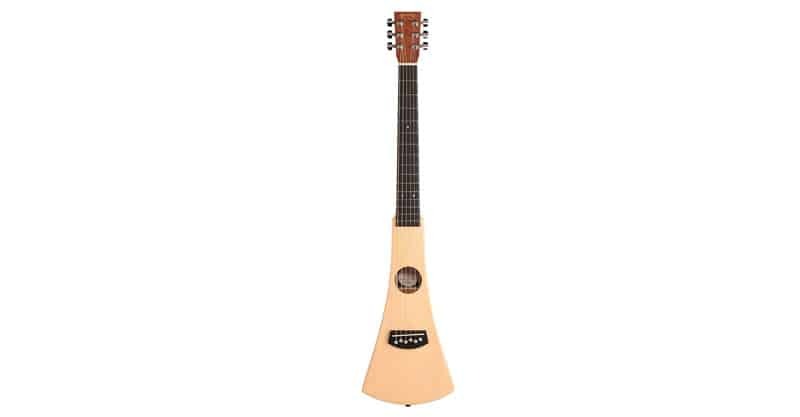 But this is a great little travel guitar – make no mistake. Dean guitars are favorites among beginners. As far as travel guitars go, this is on the low end of average – below $200. Personally, I think they’re fairly visually appealing. I’ve always liked the winged Dean head stock. As far as aesthetics go, the Deans come in four colors/makes: spruce, mahogany, black mahogany or bubinga. The build is average. It’s all-laminate, and made in China. But hey, you’re saving money, and these guitars come with a custom soft case. These guitars do what travel guitars are supposed to do: they play nice, travel well, and aren’t terribly expensive. They’re great options for the traveling guitarist or guitar newbie. No, that’s not a spelling mistake. “Guitalele” is a combination of a guitar and a ukulele. 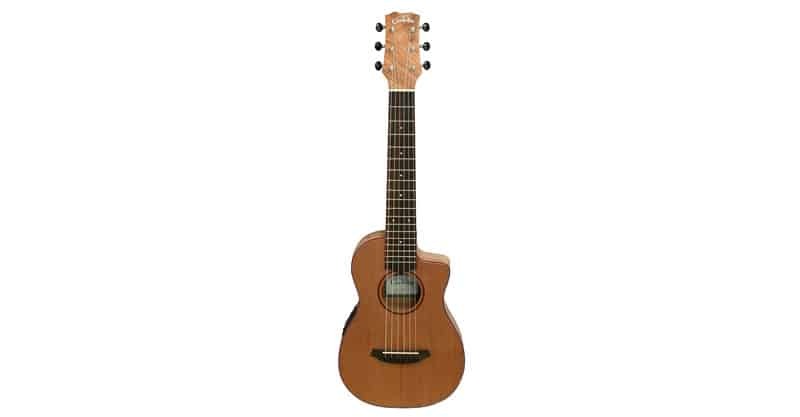 The Yamaha GL1 is like a mix of a classical guitar neck with a ukulele body. It might seem a bit unbalanced at first brush, perhaps, but it’s perfect for travel. If you prefer pumping nylon over steel, or you’d just like to bring something different with you on the road, you’ll enjoy this low-priced and portable axe. One thing you should be aware of, however, is that while it does have six strings, it does not use the standard guitar tuning. It has been pitched up to A, making the tuning closer to a ukulele except with two additional bass strings (A, D, G, C, E, A). Maybe a bit unusual, but a great instrument nonetheless. It’s hard to go wrong at this price point. Here’s another worthy entry into the nylon category. 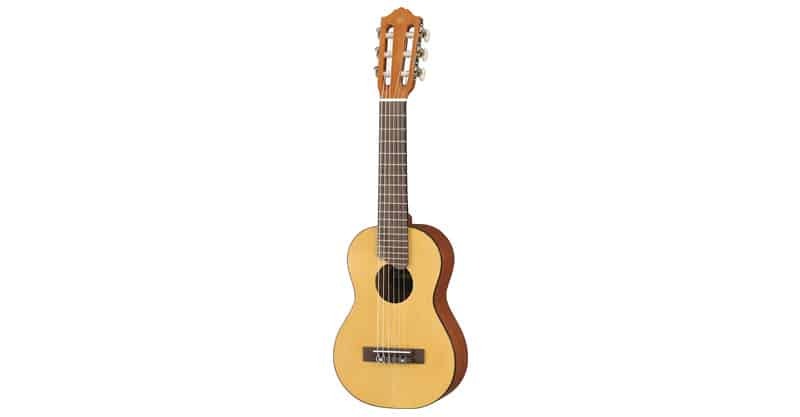 Nylon string instruments is what Cordoba does best, and the Mini M is no exception. This instrument comes with a solid spruce top with mahogany back and sides. This certainly goes a long way towards enhancing its surprisingly big tone. It also has a great neck despite being a travel guitar. As with the Guitalele, however, it’s tuned to A, so that’s something you should be aware of. This axe also comes with a gig bag to carry in, and the asking price is perfectly reasonable. Nylon strings tend to be easier on the fingers, so for casual players, this might be a good choice. So, maybe you like the idea of traveling with a nylon string guitar, but you’re looking for something with a little more “oomph”. Well, you’ve found it. The Mini SM-CE is like the Mini M on steroids. It comes with a cedar top and spalted maple back and sides. The neck is essentially full size and is attached to a small body. As with the Mini M and Guitalele, it’s tuned to A, so if that bugs you, then maybe move onto another option. But did you notice that this guitar is also acoustic-electric? That means you can plug it in and play it through an amp or PA system while you’re out and about. In case you want to attend and play at open mics (not to say you couldn’t use the house guitar if there is one), that might be a nice option to have. The price is about double of the Mini M, so it’s up to you whether the extra features are worth it. If you’re looking for a travel guitar, it either means: a) you can’t live without a guitar and want to take it with you everywhere you go (I’ve been there), or b) you travel a lot, and you simply can’t find a way to practice your instrument if you don’t have it with you (this is especially important if you’re paying for courses, training, or lessons, since you want to make the most of the money you’re spending). If neither of these descriptions fit, then maybe a travel guitar isn’t what you need. You may be looking for a full-sized guitar instead. Otherwise, a travel guitar will just become an accessory among your guitar collection, a novelty you won’t get much use out of. Granted, travel guitars generally aren’t that expensive, so you wouldn’t necessarily be wasting your money on one. But it’s better to put your money towards things you’ll use, would you agree? So, here are a few things to think about as you consider the various travel guitars available. You’ll be wasting your money on a guitar that’s a pain to play. 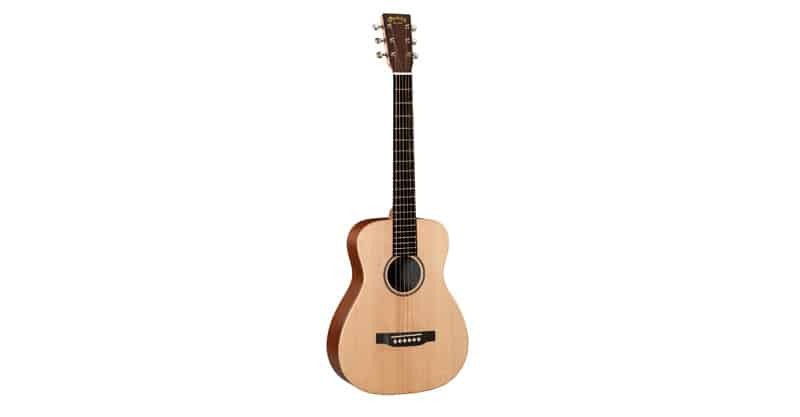 Imagine being the proud owner of a Taylor 412ce Grand Concert Cutaway Acoustic/Electric (a $3,000 guitar). This axe never leaves your home, of course, because you keep it humidified, take good care of it, and you wouldn’t want it to go missing or be damaged. Then, you pick up your travel guitar on vacation. What’s this? It feels horrible. Now, granted, you’re going to be making some compromises with a travel guitar. It’s not going to feel like a $3,000 guitar no matter how hard you try. But it should at least play decently, right? So, it’s worth taking a travel guitar for a test drive before settling on it. As with most guitars, you can get a tech to adjust your instrument, but don’t count on this to save it. Start with a guitar you like – that’s a sure bet. 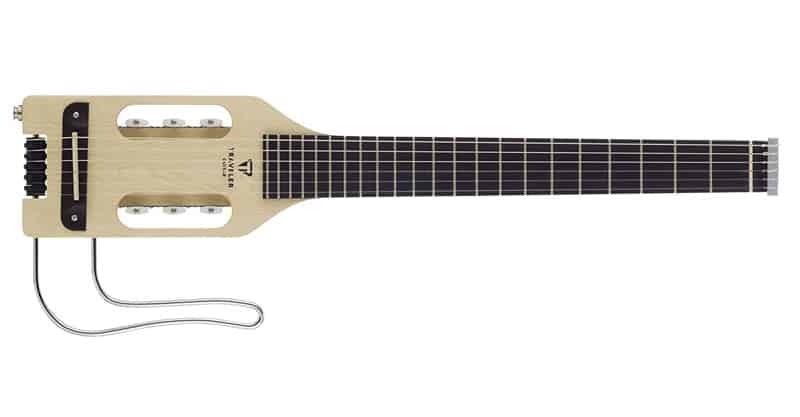 Keep in mind – this is a travel guitar we’re talking about. You can’t have it breaking on you the moment you happen to drive over a massive pothole in the road. Your travel guitar should stand up to some abuse. This doesn’t mean you shouldn’t be careful with it, but you should experience relatively few problems wherever you take it (we’ll be talking about flight cases a little later). You can’t expect any guitar to be perfect in this regard. After all, the majority are made of wood or some facsimile thereof. Also, you can’t test out the durability of a guitar unless you’ve got money to waste. Your best bet here is to read online reviews and find out if anyone has had trouble with their instrument. One bad report may not signal a poor-quality product, but many negative reviews may. Choose wisely. How much do you want to spend on your travel guitar? 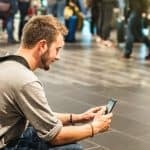 Most are going to be somewhere in the $200 to $450 price range, which is quite accessible, but you can spend less or more depending on what you want. How much guitar can you expect to get for that price? 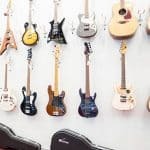 If you’re familiar with guitars and their typical sales price, then you already know that you can get a good quality product for $200 to $450, but not necessarily an amazing product. That’s okay, because it’s a travel guitar, and you’re going to make some sacrifices. It’s just a matter of how many sacrifices you’re willing to make. The fewer the sacrifices, the higher the price point. In many ways, you’re not paying for the quality of the instrument but rather the convenience it offers. Ultimately, buy a guitar that’s in a price range that resonates with you. Size is obviously an important consideration when it comes to travel guitars. 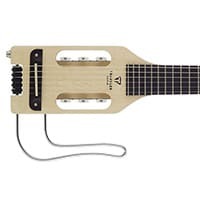 If it’s too big or awkwardly made, it defeats the purpose of buying a travel guitar to begin with. You must feel relatively comfortable with it when you sit down to play with it. Some travel guitars are foldable or collapsible, meaning they can fit into smaller cases or compartments if necessary. If you’re flying a lot, then this may be a good option for you, despite some of the sacrifices you will make with the features, tonal characteristics or sound of the instrument. If you’re mostly hiking, driving or taking public transportation, then size may not be as big of a concern. The main thing is to find a guitar that’s still portable and lightweight. This will allow you to move around more freely. So, think about how you’re going to be traveling, as that may be a deicing factor. That depends on how important tone is to you. Even if you’re traveling a lot, you probably have a lot of time at home, and that’s where you spend most of the year. So, for the few times you’re away, does it matter? How much of your guitar will you be playing when you’re surrounded by beautiful beaches or picturesque mountains? Only you can answer these questions, but I think it’s worth thinking about. If you’re a stickler for tone, sure, find a guitar that sounds good to you. But don’t obsess over it. You’re not going to find a travel guitar that sounds like your $4,000 Gibson. At the very least, it’s highly unlikely. If you can practice and write songs with it, that should be good enough. You shouldn’t ask too much more of a travel guitar. There are a few ways of answering this question. Some guitarists would probably look at what they are most familiar with. So, if you already play steel stringed guitars for the most part, you might be inclined to buy a travel guitar that comes equipped with the same strings. Likewise, if you’re used to nylon, you might go with a nylon string guitar. Other guitarists might want to challenge themselves a bit or just try something different while they’re on the road. In that case, you might buy a guitar that comes with a different type of strings. Still others might just look at the price point and practicality of the instrument rather than its features. This isn’t a wrong way of thinking about it either. So, there isn’t necessarily a right or a wrong, only a right or wrong based on what you’re looking for. But I will say that if you’ve never tried one or the other, then you might want to stick to what you’re most familiar with. As with other considerations, this one is entirely up to you. If you’re planning to perform at open mics while on the road, or you foresee having the opportunity to play your guitar through an amp or PA system, you might consider going in the acoustic-electric route. Otherwise, it might not be worth the extra money you’ll pay for it. Here’s the thing: It’s unlikely you’re going to be using your travel guitar as a performance guitar if you’re playing close to home, or even on tour. You’ll probably only use it while traveling abroad. And, if you do end up booking performances while overseas, there might be a house guitar you can use (confirm in advance). It’s certainly fun to have that option of being able to plug in if you need to. But there probably aren’t too many situations where you’ll require it. If you think you’ll use it a lot, then maybe a travel guitar with a pickup would serve you well. While having a travel guitar is great for moving around, don’t forget to protect it properly. You should always bring a guitar flight case so you can transport it safely when traveling abroad. This will help protect it from breakage, as the last thing you’d want after a long flight on tour is a guitar which you can’t play. There are a number of good cases to choose from so have a look. Hi great review, but can you tell us the overall dimensions and weight of each guitar? You show a picture but no review of the Traveler Brand ultra-light guitar. Did this one not make the cut for your list? How does the Washburn Rover compare? There are always a few for sale on e-Bay for a few quid either side of £100. I know it’s hard to cover everything but you really missed out by not including the traveler guitar made by Gretsch. I’ve owned one for years and just love it. But of course that just my opinion.